Healthy Suggestions: Ideal for tropical smoothies, fruit cocktails and as a mixer. A delicious, natural topping for yogurt, ice cream, fruit, pastry and dessert. Suggested Use Serving Size 2 Tbsp. 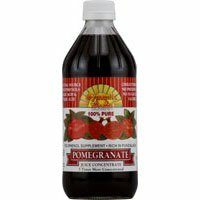 (30 mL) of Pomegranate Juice Concentrate. May be mixed with water, seltzer, juice or a beverage of your choice. Other Ingredients Pomegranate juice concentrate. Natural Ingredients in this product can vary the color, taste and consistency from batch to batch. This does not affect potency or quality. NO yeast, corn, wheat, gluten, soy, dairy, fish, animal derivatives, preservatives, artificial colors or artificial flavors added.